You are here: Home / DIY & Decor / Interior Decor Ideas / Master Bedroom / Wardrobe vs Dresser? The BEST Small Closet Solutions! Dealing with a small closet? Have you ever considered which is best – a Wardrobe vs Dresser? 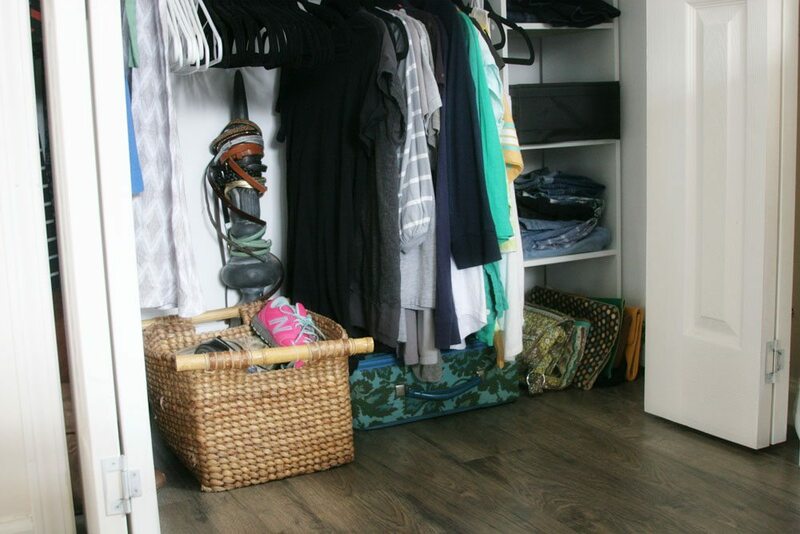 The BEST small closet solutions might be found outside the closet: floor to ceiling wardrobes. What are the BEST small closet solutions? The answer to that question might actually be found outside the closet. What?! Yes! I can speak from experience. Our relatively small Master Bedroom, with a similarly small closet, is seriously short on storage space. We solved that problem by evaluating two furniture solutions – Wardrobe vs Dresser – and I’ll help you solve it for your room, too! If you own an older home, you are probably lacking grand, walk-in closets. 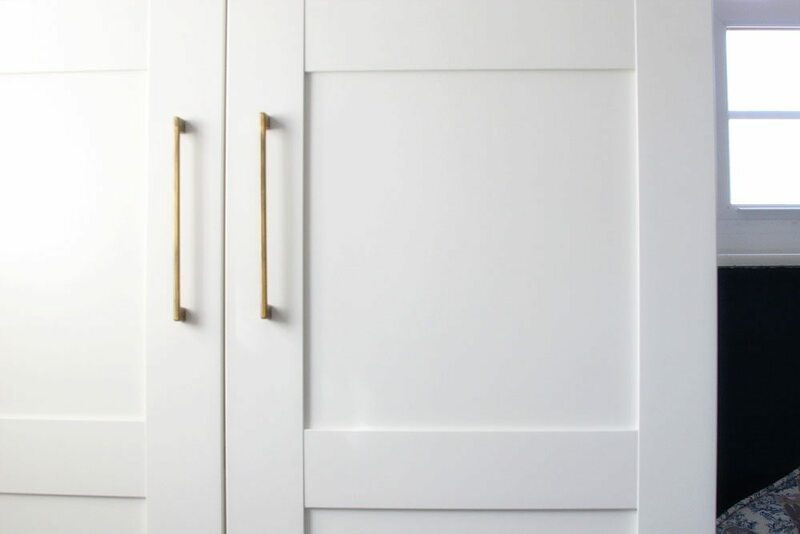 Big closets are, in general, a feature found in newer homes. This is exactly our situation! Our home was built in the 70s and the closets are on the small side, especially in the Master Bedroom. At less than 5′ wide – and featuring only one hanging bar – it doesn’t hold much clothing. to roomy – and big on storage. rather than adding more square footage. 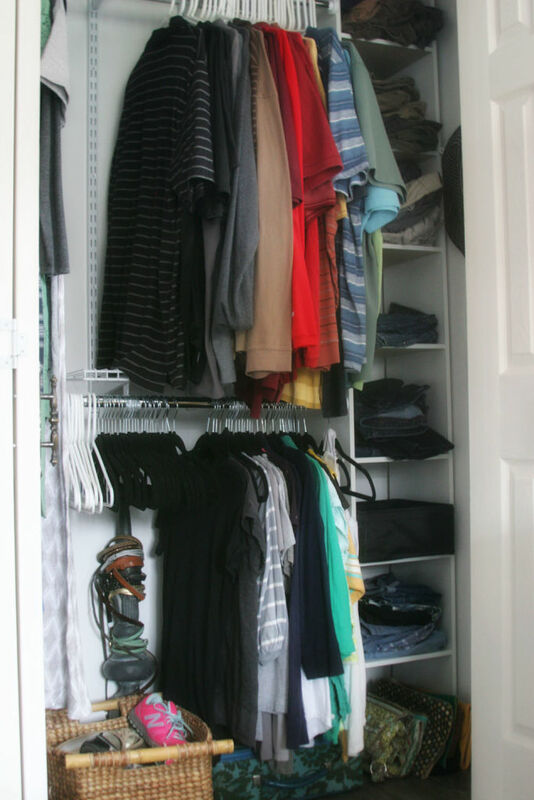 First, maximize the space in a small closet with an organization system. Contrary to popular belief, closet systems are not out of reach for tight budgets. It might not be a California Closet… and you might not get every custom component… but it can be affordable. Where can you buy cheap closet systems? Check out big box stores like Lowes and Home Depot, or online retailers like Amazon for a selection of affordable closet systems. On the upper shelf, we store rarely-used and seasonal items. The rods are hung far enough apart to hold men’s shirts on the top level and women’s shirts on the bottom level. It’s important to measure first, to determine the hanging location for each bar and shelf. The bottom shelf and hanging bar are about 12″ shorter than the top shelf and hanging bar. This allows long dresses and suits to be hung from the top bar without hitting the lower shelf. While I’d love to claim all of our clothing fit in that tiny closet…. it just didn’t. We need storage for t-shirts, shorts, underwear, etc. A single storage tower wasn’t cutting it for all of our folded items. Of course, the typical choice for folded clothing would be dressers. 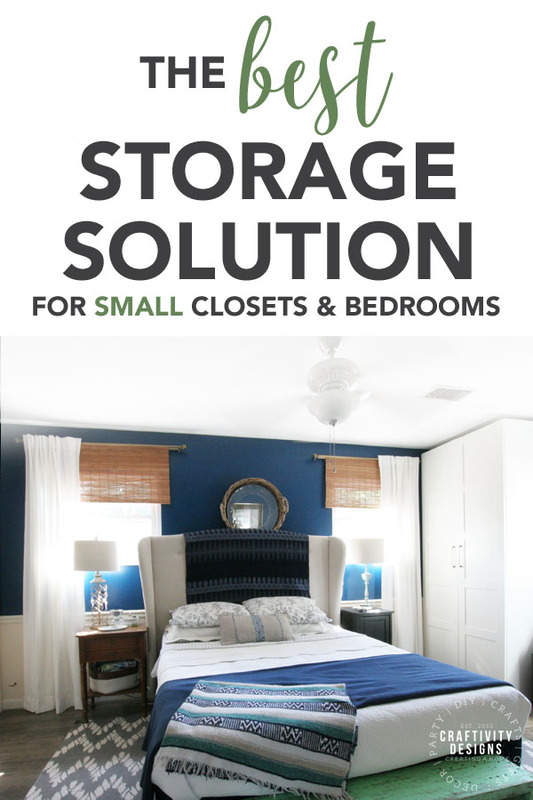 However, it’s not uncommon that small closets go with small rooms. Can you relate? A couple dressers in our small Master Bedroom quickly cramped the entire space. So, what do you do when you are short on floor space? Build up. Just like in our small closet (switching from one shelf and hanging bar to two, adding a tall storage tower), it’s so important to consider vertical space. So, for example, which is better? 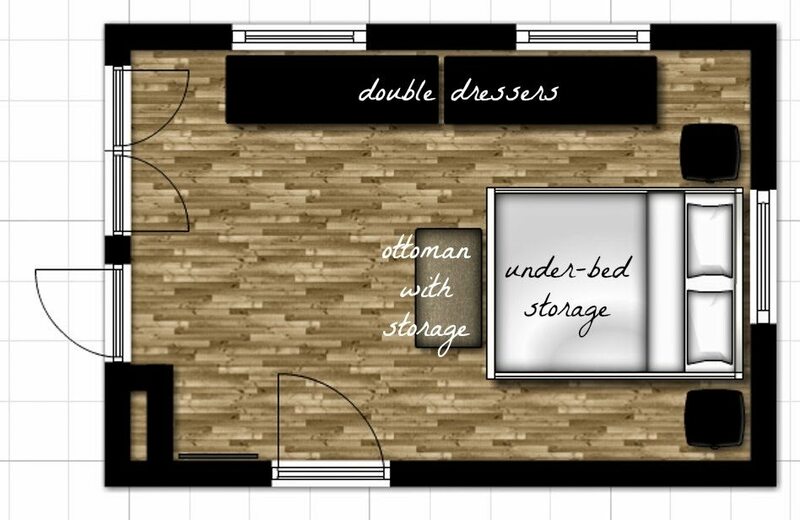 A 5′ long dresser or a 3′ wide wardrobe? The math is simple. 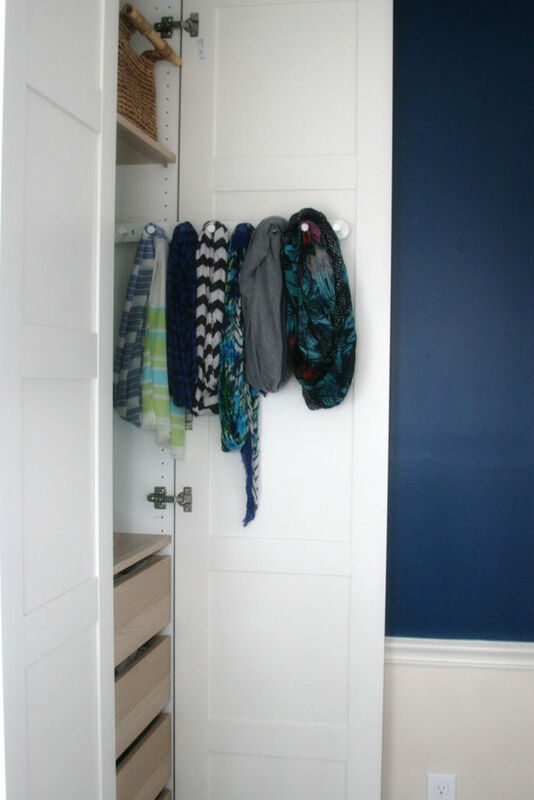 Wardrobes will almost always save floor space and provide at least comparable (if not, improved) storage. 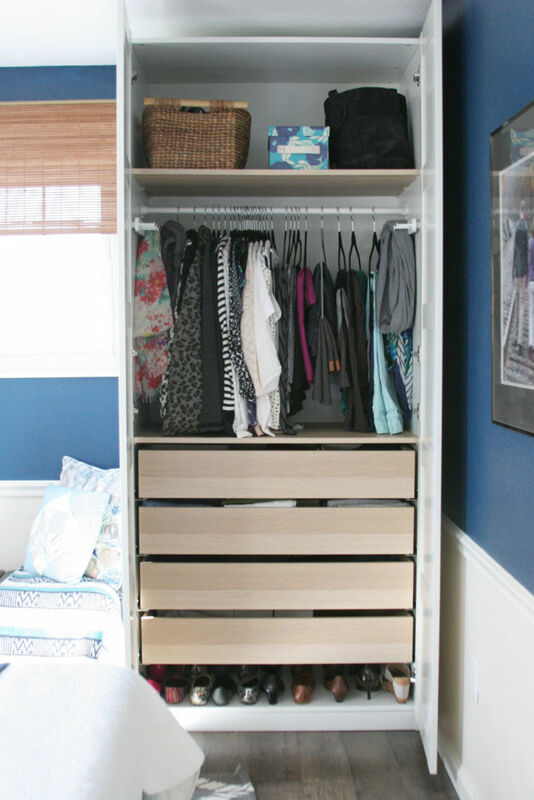 Wardrobes are the best solution for small closets and bedrooms. 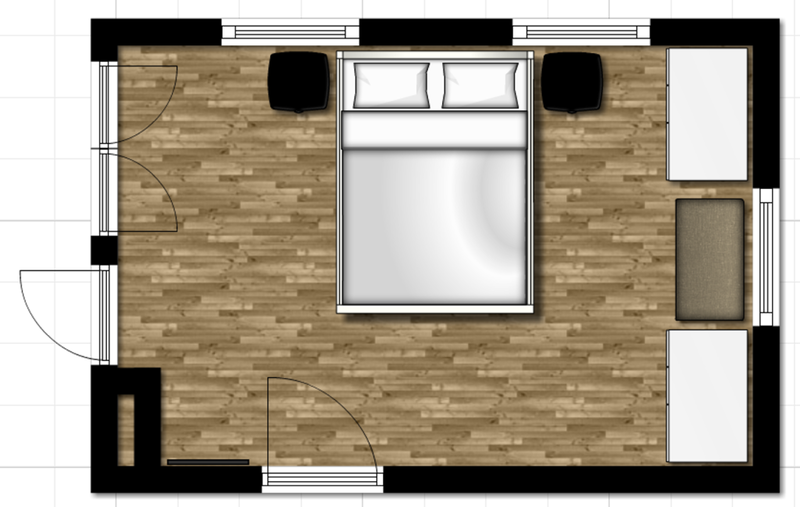 Want to see our *now* roomy bedroom with wardrobes instead of dressers? Don’t be deceived, this is a small room, folks! That is only a queen bed, and – you see – the headboard doesn’t even fit between the two windows. 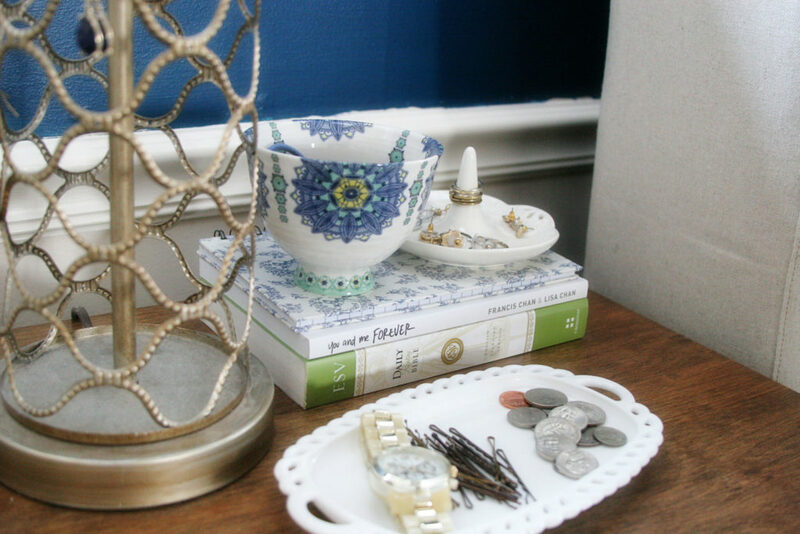 Plus, our nightstands are small, checking in at less than 18″ wide each. Once we knew that wardrobes were the best choice to fix small closet dilemma, we started shopping. Space was the first priority, with price a close second. We landed on the Ikea PAX wardrobes. Reaching to ceiling hight (8 ft), they provided the most space we could get. Though they weren’t exactly ‘cheap’ (each ran around $450 after selecting all the components) they were still affordable, especially considering the level of customization we could select. the shelf/drawer/hanging bar combinations are endless. Do you have a small closet? 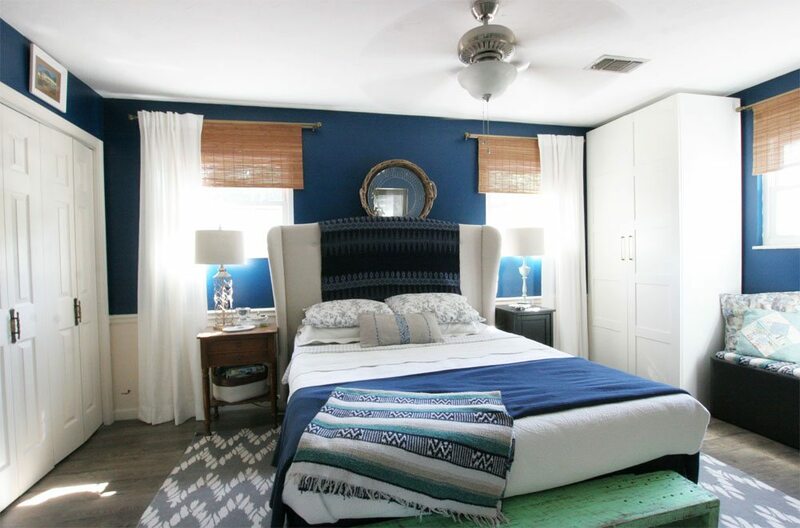 Does your home have a small master bedroom? Though I’m sure a walk-in would be wonderful, how have you solved this dilemma? I’d love to hear your small closet solutions!